We’ve been hanging out on Phuket Island for several weeks now. We hauled out at G&T boatyard for some work, but we bookended our haul out with visits from both of David’s siblings: Thomas first, the first week of January; and then Julie at the end of our haul out. Both Thomas and Julie wanted to see the Phuket Big Buddha statue. 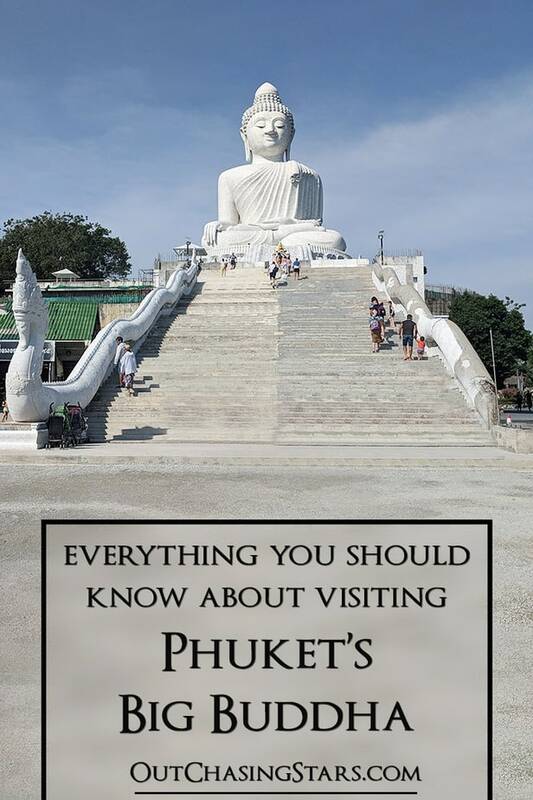 One of the top attractions in Phuket is the Big Buddha statue, formally Phra Phutta Ming Mongkol Akenakakiri. From most of southern Phuket, the statue can be seen high up on Nakkerd Hills. The population of Thailand is about 95% Buddhist. A lot of our travel this past 8 months has been primarily Muslim countries (Indonesia and Malaysia), but Thailand and our layover trips in Tokyo are exposing us to the Buddhist culture. The Big Buddha is very big – 45 meters tall – and yet it’s only the third biggest Buddha in Thailand (the Great Buddha of Thailand is 92 meters tall). Thai art depicts Buddha in about 80 attitudes – or positions. 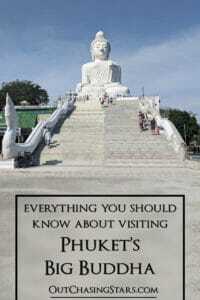 The Phuket Big Buddha is in Maravijaya Attitude. Buddha is seated, in a relaxed posture, although the story behind this position is that he was being disturbed by maras (demons). This position is the most common one for statues. Below the statue is the Wat Kitthi Sankaram temple. The statue depicts Gautama Buddha, of whom Buddism is founded upon. Gautama taught in India between the 6th and 4th centuries BCE. His teachings are often called the “Middle Way”; a moderate lifestyle between indulgent and ascetic. Both times we visited the Big Buddha we hired a car to take us up. There’s a fairly big parking lot at the top, where our driver would wait for us. All along the steep drive up, there are cafes and, sadly, elephants working in the tourism industry. People are hawking elephant rides or opportunities to pet a baby elephant, all while the elephants are chained up and out in the heat. Please do not encourage this kind of tourism! As this location is a temple, you should dress appropriately. Sarongs are available for free to cover your shoulders or knees if necessary. Our first visit with Thomas was late afternoon on Thursday, January 3rd. Our second visit with Julie was Monday, January 21st, mid-morning. There were a lot fewer people in the crowd when we visited the second time. Firstly, Phuket is very busy over the holidays. I also expect that the morning is a better time to go. The Big Buddha was completed in 2014, but there is currently a lot of work going into the temple around the statue. The rooms directly underneath the Buddha were under construction, as is the new staircase. I can’t wait to see pictures when it’s done, it’s going to be beautiful. During our first visit, the monks were in a small room underneath the Big Buddha chanting. A microphone was broadcasting on loudspeakers around the site. On our second visit, the monks were downstairs in the main big room towards the end of the visit, chanting. When they were downstairs, you can’t really hear them up top. Both visits, the monks offer blessings. You can make a donation, and the monk will give you a sai sin– a string bracelet – and bless both you and the bracelet with holy water. A young boy and woman receiving a blessing. The monks in the background are chanting. The view over Chalong Bay. One side of the stairs is finished. Selfie with the Big Buddha! The Big Buddha is covered in white marble tiles. Naga pose, being protected by cobras. Notable monk statues around the base of the Big Buddha. A second Buddha statue, called the “Gold Buddha”, is actually brass. One can purchase these ornaments to write wishes on and hang in the nearby trees. and if you try all that lot and want more ideas, drop me a line! -We went to see Aquaman! -sunset from the boat in Nai Harn bay is just as good – we saw two green flashes! Thinking we will do the orchid farm tomorrow!